Where did your passion for food start? I didn’t realise at the time, but it was always there. I still have my recipe book from early school years and I remember distinctly being taught to lightly rub in the butter and flour to make a crumble at 11years old and the pride at taking it home. At University, I would buy cheaper meats and fish. stuffing rainbow trout with bulghar wheat and herbs … seems relatively normal now but that was 1994.. houmous had barely made it here. I travelled around the world, and my passion grew as each new country brought different inspirations…Canada’s Asian influences, New Zealand’s clean food, all the European melting pots and the spices of the Caribbean. What encouraged you to follow your passion and undertake professional training? Why did you choose Edinburgh New Town Cookery School? 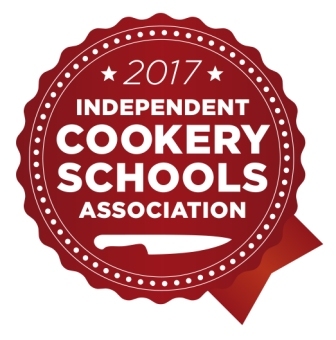 It is important to have a recognised qualification and the Edinburgh New Cookery School has a very good reputation. 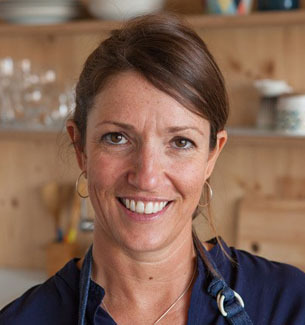 Fiona’s background and experience managing Leith’s Cookery School was a big influence on my decision. I wanted the classic French curriculum that Leith’s provided, however I felt the smaller classes and one to one attention that ENTCS could provide would more suit my needs. I have always liked Edinburgh and I felt that I could live here after the course if the opportunity presented itself, which it did! What aspects of cookery inspire you? I love the combination of creativity and organisation. The seasonality and quality of food here in Scotland is unique and I think provides some of the best food in the world. The feedback from clients is very important to me as well as the inspiration through their ideas and needs. What are the top things you learned whilst at ENTCS that have been most useful? The things I learned pop into my mind constantly, I can hear the teacher’s comments and tips as I cook. Learning the basics meant that I understand why things happen and therefore how to prevent and fix problems as I go. Red wine reduction – I make a mean one. Time management and organisation – those day plans really make sure you can produce great food ON TIME with a clean station/kitchen/sink. The importance of being and looking professional at all times. Bread – any type anywhere! Fish filleting and meat filleting – so often you are given a piece of meat or fish by your boss or a client and you need to know what you are doing. So many more things, I could write a book! Where has your career led you? I now travel all over Scotland working in lodges and private houses. I work for a week or two, 7 days a week, 2 or 3 meals a day. Then I come back to Edinburgh and have 2 weeks off! After I finished at ENTCS I worked in Edinburgh with various restaurants and cafes to get practical experience and improve my speed. I could produce good food, but I needed to produce it faster. I also needed to learn what food was available in Scotland, what suppliers to use, and what my niche might be. What would you say to someone considering doing the same course as you? To get the most from the training, the self-learning must continue in the evening and at weekends. Do the written preparation; research the food you will be cooking. Do you have any advice for newly qualified students? Get as much experience as you can, work for free at lots of different places, work very hard and always maintain positivity when you go there. Not only do you make fantastic contacts in the industry but the knowledge you gain as well is invaluable. Never stop learning and always put everything into any work you do.